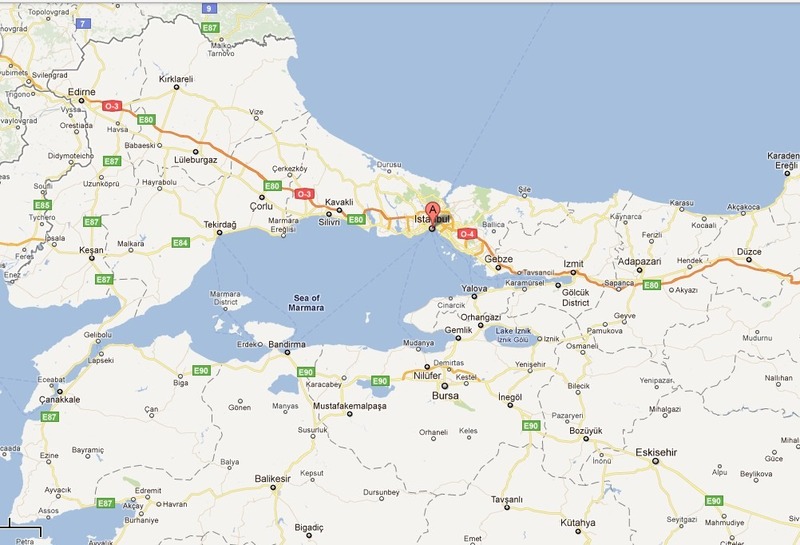 Last spring Turkish news agencies covered reports and rumors about a new canal proposed somewhere in the vicinity of Istanbul that would connect the Black Sea with the Sea of Marmara. The reports referred to the speech made by Recep Tayyip Erdoğan in late April as part of his reelection as Prime Minister of Turkey. As these reports made repeated reference to the Corinth Canal, along with other famous canals of the world, they triggered google alerts and filled up my inbox. I set them aside for a later time. A month or so ago, Seda Kundak and Mete Başar Baypınar, faculty specializing in urban risk assessment and regional planning at the Istanbul Technical University, published an article outlining what is known about the proposed project and assessing the risks involved in its implementation. The piece is freely available here as a PDF, and makes for a very interesting read. Seda Kundak and Mete Basar Baypinar, “The Crazy Project – Canal Istanbul,” in TeMA, Journal of Land Use, Mobility, and Environment 4.3 (2011), 53-63. The article is interesting in many respects, but especially as it relates Erdogan’s “crazy idea” to various contexts. It firstly relates this particular proposal to a pattern of great Turkish leaders recommending and even attempting to dig canals through Istanbul’s peninsula since Sultan Suleiman the Magnificent’s efforts in the 16th century. 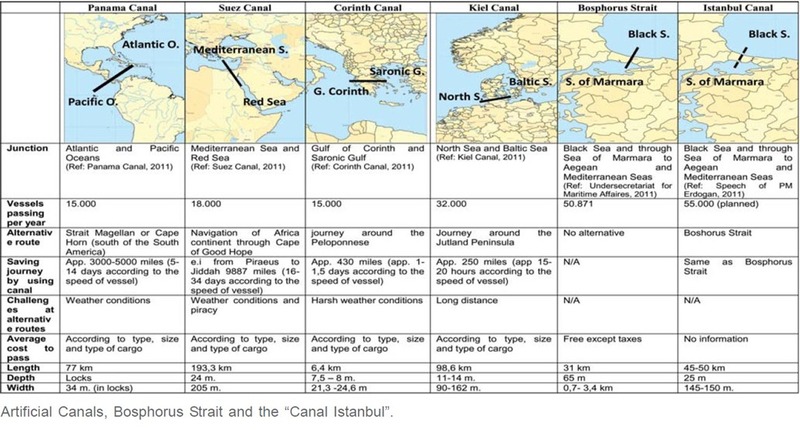 Whereas previous 7 attempts were tied to specific economic purposes (serving the timber trade to Istanbul), this new Canal Istanbul Project, as the authors note (p. 53), is a much grander one, “not only because of its objectives, but also of the location choice, the financial model to be used in construction and because it provokes international maritime conventions.” The proposal calls for a canal 50 km long, 150 m wide, and 25 m deep, to be completed in the year 2023. But that is not the end of it. The proposal also involves major regional transformations, including construction of a major airport, seaport, auto and rail bridges, residential centers for 700,000, and various other cultural, political, and economic facilities. Kundak and Baypınar believe the canal will follow the course of the lakes about 40 km west of Bosphorous Strait (in the image below, the area just to right of the E80 marker in the south, extending northward in an arc to Durusu). The authors note that the prime minister has linked such scale of investment to a destiny 400 years in the making (p. 54). Finally, the piece raises questions about the uncertainties and risks involved in such an endeavor. Whereas Erdogan has linked the proposal to Turkey’s economic development and global role and the return of the Bosphorous Strait to a greater state of quietude and local traffic, the authors offer an assessment of the potential negative consequences on local habitats, vegetation, natural water sources, archaeological, sites, and cultural heritage (p. 58). For example, how would different salinity levels between the two seas impact the local ecosystem and fish life? There is also the great uncertainties of investment: will it reinforce or undermine Turkey’s economy? Although the authors have their own strong point to make with the article—they call for various institutions and international watchdogs to play a role in the planning—the piece fascinated me for its many direct parallels with canal construction in antiquity, most especially the explicit links between grandness and canal proposals, the uncertainties over consequences, the questions of motivations. Whereas the Canal Istanbul Project is indeed much more impressive in its scale and linked to an economic and cultural system of an entirely different sort from antiquity, this “crazy idea” still points to the popular perception of monumental canal construction throughout time and space. We will look forward to seeing whether this canal actually surfaces or whether the mere proposal was the point of it all.